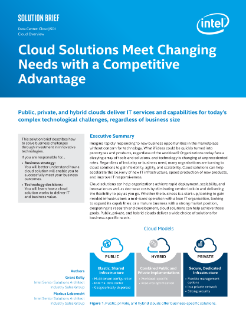 Cloud solutions for public, private, and hybrid clouds deliver IT services and capabilities for today's complex technological challenges, regardless of business size. Cloud solutions can help organizations achieve rapid deployment, scalability and innovation plus decrease costs by eliminating vendor lock-in and delivering flexibility to pay as you go. Whether the business is a startup, ...looking to gain needed infrastructure; a mid-sized operation with a lean IT organization, looking to expand its capabilities; or a mature business with a strong market position, deepening its research and development, cloud solutions can help achieve those goals. Public, private, and hybrid clouds deliver a wide choice of solutions for business-specific needs.